Led by TBG co-Artistic Directors (Seth Barrish and Lee Brock) and Executive Director (Robert Serrell), The Barrow Group School offers professional and emerging artists training in acting, directing, filmmaking, playwriting, and screenwriting. At the heart of the Barrow Group Approach is the desire to promote clear and concise tools of the trade. 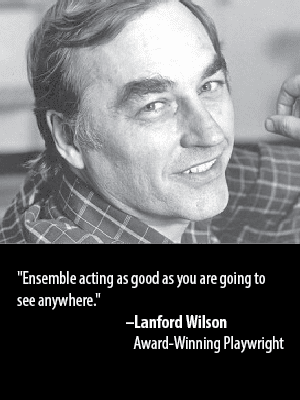 These tools are outlined and published in “An Actor’s Companion – 99 Bits of Craft” by Seth Barrish. Faculty at The Barrow Group go through a year and a half teacher training program with Seth Barrish and Lee Brock, in which they learn to teach The Barrow Group Approach, so that in every class there is a codified method of training. Once you have studied at TBG, you are welcome to join the TBG School Facebook Group and let other alumni know what you’re up to. Learn more about the TBG Apprentice Company. It’s free to audit a class at The Barrow Group. Should you want to audit more than one class, the fee is $35 for each additional class. Email audit@barrowgroup.org to set up an audit. Schedule an audition for these classes: Scene Study Intensive I, Monologue Workshop, 6-Week Summer Acting Program, and the 1 Year Acting Program. For Film/TV I, students must either audition in person or submit a headshot and resume to school@barrowgroup.org. Video submissions – students not currently in NYC can submit a video audition ( a 1 to 2 minute contemporary monologue) along with a headshot and resume to school@barrowgroup.org. Click here to learn more about our Developmental Wing, which serves as the bridge between our School and Production Company. TBGfilm is a digital initiative at The Barrow Group, where we provide a forum for our students and community members to share the work that they are creating. There is a year-long teacher training program to become an instructor at TBG. Read about The Barrow Group Teachers here. TBG hosts quarterly mixers for current and past students. A great opportunity to meet new folks. Check out the calendar here. Please refer to these school policies before registering for a class. Check out the past One-Year Program and Apprentice Company student showcases here. If you’re looking for a scene to work on, view a list of our scene suggestions. Click here for details on student studio rental. TBG teachers: click here for the teacher resource page. Curious about enrolling? See what former students have to say about TBG.